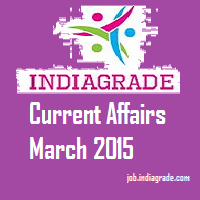 Current Affairs 3rd March 2015- From now our current affairs updates are changed lot with compare to other site. Our INDIAGRADE JOB will provide the current affairs for world wise, India wise, state wise, sports affairs on 03/03/2015. You can download the daily current affairs as a PDF format on end of the March month. So all the candidates those who looking for affairs then we request you to keep visiting this page for further more updates. Like our Facebook, Google +, Twitter, Linkedin page to get instant updates. Magnitude 6.4 quake strikes off Indonesia, no reports of damage. Foreign Secretary Subrahmanyam Jaishankar meet Pakistani counterpart Aizaz Ahmed Chaudhury in Islamabad. Bill Gates is named world's richest person again by nearly $80 billion. IRCTC launch concierge service at New Delhi station. K K Sharma from Goa is Delhi chief secretary. BJP chief Amit Shah unfurls world's largest Indian tricolour in Faridabad. Mukesh Ambani richest Indian for 8th year, Bill Gates gain top globally. Alexander Graham Bell Birthday(March 3, 1847, Edinburgh, United Kingdom). Singer Ronan Keating birthday[March 3, 1977 (age 38 years)]. Actress Jessica Biel birthday today[March 3, 1982 (age 33 years)]. Scientist Robert Hooke at March 3, 1703, London, United Kingdom. Boxer and World Heavyweight Champion James J. Jeffries at March 3, 1953, Burbank, California, United States. South Africa hammer Ireland to register win with 201 runs. Both Amla & Du Plessis scored a century. Hashim Amla becomes the fastest player to reach 20 ODI centuries. Pool A: New Zealand, Sri Lanka, Bangladesh, Australia are top four teams. Pool B: India, South Africa, West Indies, Ireland are top four teams in Pool B section. Mary Kom decides to quit boxing after Rio Olympics in 2016.